If you have been wanting to try this amazing sport but have been hesitant, Discover Scuba is the best way to get your feet wet. 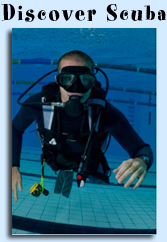 Once you have experienced what it is like to breathe underwater we know you will be hooked! We offer Discover Scuba once a month but if you can’t make one of our scheduled offerings feel free to contact us so we can arrange a special night just for you. $100.00 for a two hour experience. You will spend roughly one hour in the water. Bring a towel and bathing suit, we supply everything else. If you decide you’d like to experience scuba even more before deciding to go all the way and get certified you can also try diving in the local waters with one of our instructors after completing the Discover Scuba program. By appointment, call to schedule – minimum, two participants.